DUI, also known as “driving under the influence” and/or “DWI” is a very serious criminal offense and can have significant consequences to a person’s future. License suspension and possibly jail time are just two of the many penalties that someone faces when charged with DUI. This is a very specialized area of law. That means, it’s not best for a person to hire an attorney who doesn’t specialize in DUI criminal cases. Even if an attorney has been practicing criminal law for decades, they may not have any or enough experience specifically defending DUI cases. The law in this arena is ever evolving and only those who specialize in DUI cases know the specific laws that can benefit their clients. Mark Eiglarsh, from the Law Offices of Mark Eiglarsh, is a top notched, award winning best Miami DUI lawyer. He has extensive experience handling DUI cases. In light of his knowledge and background, he’s obtained countless wonderful outcomes for his DUI clients. Few have his passion for these types of cases. It’s no wonder why his peers hold him in high regard when it comes to handling DUI and DUI related offenses. The above percentages refer to one’s blood alcohol content (BAC) at the time a person were driving and/or in "actual physical control of the vehicle. Someone arrested for DUI faces penalties through both the criminal arena and the Department of Motor Vehicles (DMV). First, regarding the penalties through the DMV, should one refuse to submit to a lawful chemical test, one will automatically face a suspension of their driving privileges. If a person blew over the legal limit, and this is their first DUI arrest, they’re facing a six months license suspension. If a person refused to submit, they're facing a one year drivers license suspension, assuming this is their first offense. A second refusal will result in an 18 month license suspension. The administrative suspension of one’s driving privileges can be challenged at the DMV. A skilled veteran DUI attorney in Miami knows what to do to increase the chances that one will win their DMV driver’s license hearing. Jail time may be imposed for even a first time DUI conviction. While there's no minimum mandatory amount that must be imposed on a first offense, judges may sentence a first time defendant to up to six months in jail, assuming the reading was below a .15%. If the reading is above .15%, the statutory maximum goes up to 9 months in jail. A second conviction could result in a sentence of up to one year in jail, with a minimum 10 day jail sentence (depending on the date of the prior conviction). On a third offense, a 30 day jail sentence may be the minimum, up to one year in jail, depending on when the prior convictions were. A fourth conviction can be charged as a felony, subjecting you to up to five years in prison, $2,000 fine and a lifetime revocation of your driving privileges. One of the most significant penalties is that a DUI comes with a mandatory "adjudication." Also called a "conviction," it means that it can never be sealed or expunged from your record. Assuming you are ever able to secure insurance again in the future, it will invariably come with a much more significant price tag after a DUI conviction. We recommend that you contact us immediately if you, or someone you know has been arrested for DUI. 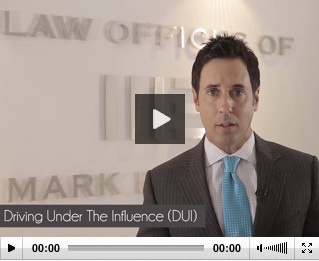 If the offense was committed in Miami, you deserve the best DUI attorney in Miami. That’s what we deliver. If the DUI was charged in a surrounding county like Broward or West Palm, we have extensive experience fighting cases in those jurisdictions. We have only ten days to file the necessary paperwork to challenge the administrative suspension of your driving privileges. Additionally, it's imperative to hire an attorney who specializes in DUI matters. At the Law Offices of Mark Eiglarsh, we've been handling these matters zealously and aggressively for over two decades and have achieved extraordinary results for countless many of our cherished clients. Call us immediately to assist. 305.674.0003. The initial consultation is free. We look forward to assisting you.